The South Houston High School Navy Junior ROTC program was recently named a “Most Improved Unit” for delivering a near flawless performance during their Annual Military Inspection and for their exemplary service to the community. The unit, comprised of over 200 students, was selected out of 57 schools in the Area 10 District Unit, which covers most of Texas – to receive the distinguished award. United States Navy officials presented the award based on results of an annual inspection conducted last month, which took an in-depth look at the South Houston NJROTC program and allowed students to showcase what they have learned throughout the school year through personal inspections, drill routines, and curriculum evaluations. “The inspection covers specific areas that help protect the integrity of our NJROTC program, including testing students on their knowledge of the curriculum, cadet participation, academic success and community service,” said MSgt Jamal Cheeks, who manages the program with LCDR Joe Gibson and Chief James Swain. 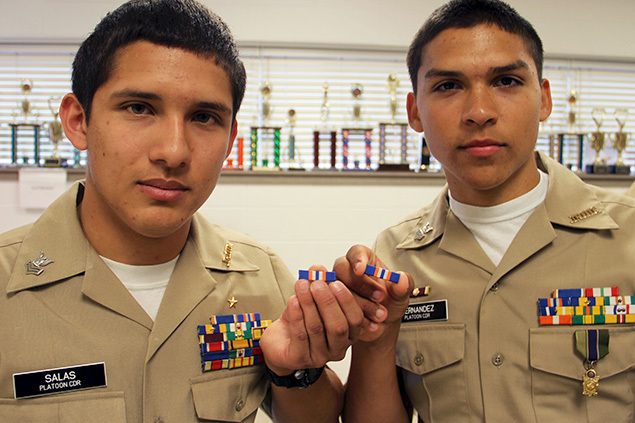 The NJROTC at South Houston has been marching upward in the overall success of the program. All three instructors have been front and center in reinvigorating the program, especially in the areas of participation, community service, functionality and local and national visibility. Participation has nearly doubled from 100 to over 200 cadets. These numbers are expected to triple over the next couple of years since the school decided to extend the program to Pasadena Memorial High School. “It’s a grand slam because we are offering the JROTC program to Memorial and now all schools in the district will have a JROTC program or access to it,” Cheeks said. This year alone, students have garnered over 1,000 hours of community service by mowing lawns for senior citizens as part of the Operation Beautification initiative and several other projects. The program has also received national recognition after students presented colors at a Houston Rockets and Texans football game. “They have instilled PRIDE: Preparedness, Responsibility, Integrity, Discipline and Effort which are the guidelines our cadets observe and practice,” Harvey Zuniga, South Houston assistant principal said. “This achievement speaks volumes about the school and our community. I could not be more proud."